We had been out for a little drive today...I came home this evening and checked my email. Found this Santa Claus waiting for me. She had wanted her mama to make her a Santa Claus mask, so her mom obliged. We decided to go for a little drive today, which led to us going to Mansfield, Indiana. We have our fishing gear with us almost all the time so headed there to throw our lines in the water. I had no more than threw my line in when I seen a kitty down the way a little bit. I stopped and went over by it to try to pet it. It wanted to be petted but was afraid at the same time. It would jut meow when I would talk to it. I finally gave up. While I was messing with it, Roger caught a couple stripers... so I quit and returned to fishing. It was just cold enough, or maybe it was that I was not dressed warm enough, till I decided to quit soon and went back to look for the kitty again. I could not see it anywhere, so returned to the car. I sat there watching for it, and watching Roger fish...he decided to quit. As he was putting his reel in behind me, I was trying to look back at him...and as I was doing that he saw the kitty cross the road again. So off we go...we tried to sneak up to it, but it went back across the road. Roger stayed back and I followed...her meowing and answering everything I said to her. 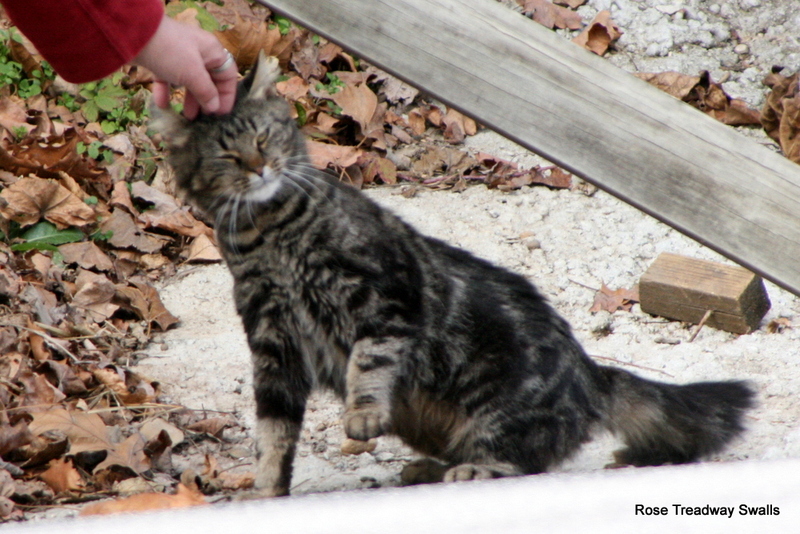 Finally, she let me pet her...oh, she just absolutely loved to be touched. But she did not want to be held. I picked her up twice...at least I think 'her' is the correct term. Anyway, she would have none of it. Oh, she didn't go wild or anything...just squirmed so much I didn't want to frighter her farther and let her go. You can see a better pic of her over on my Time Stand Still blog. If she had been willing to be held, I might have been the owner of a new kitty. Her face is so much like my last Cougar's...and her little meow will haunt me for a while. If I lived close, she would at least have food. But I need another cat about like I need another hole in my head. But if she were close, I would probably have her. I just cannot resist a face like that. And it is not just the markings and colorings...it is the look in the eyes. BTW, those last photos were taken by my husband, not by me. I forgot to change the watermark on them. she makes a cute Santa!! What is she wanting for Christmas this year? Hi Rose, Cute picture of Lorelei Claus.... Love it!!!!! Bet you'll think about that cat over and over again... I even wonder if you decide to go back to get it.....Do you think it belongs to anyone???? Good Luck!!!! Cute little Santa girl, and cute kitty too! We always hate to leave kitties behind, so I know what you mean about it haunting you for a while. Sounds like a nice day. What a cute Santa Lorelei makes! 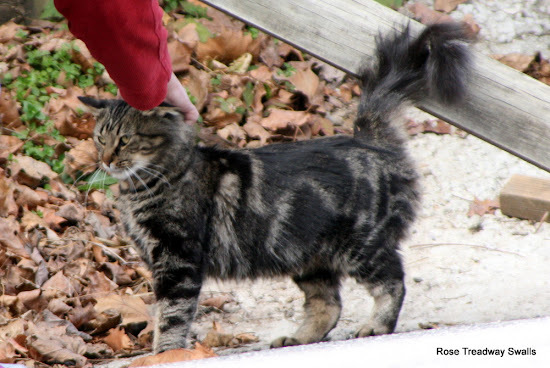 That is a pretty kitty that you found. Looks like the fun has started! What a cute Santa! Happy Holidays! Kitty sure enjoyed your attention. Oh, I was talking about the kitty. 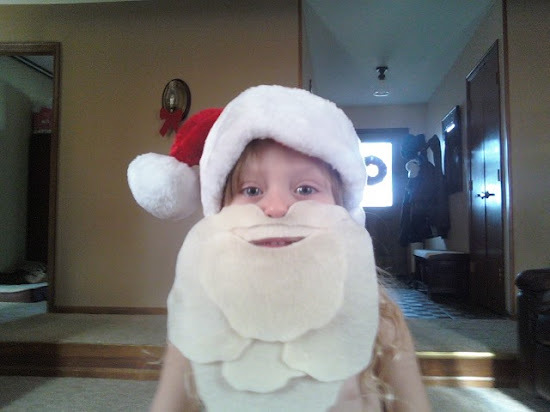 But hey, Lorelei is also very cute with her Santa beard. Lorelei has such a great imagination. Love the Santa beard! So cute! And the kitty. Glad you finally got to pet her.